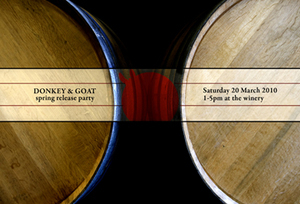 This is looking like an extra-tasty tasting: ~A DONKEY AND GOAT~ are having their spring open house party on Saturday March 20th. Not only will they feature their seven new spring wines, but they have invited the folks from the new Locanda da Eva, which opens in April, to tease their new restaurant (look for more on the restaurant in tablehopper very soon). Here are the edibles: deviled Soul Food Farm eggs with roasted pepper, capers, and chicken liver; grilled beef spiedini with garlic, herbs, arugula, and lemon; fresh ricotta on crostini with roasted carrots and marinated beets; pork liver pâté with pickled vegetables; and tortilla española with spinach, mushrooms, Fontina, and romesco sauce. Wines include: ‘08 Four Thirteen; ‘08 El Dorado Roussanne; ‘08 The Prospector Mourvèdre; ‘08 El Dorado Syrah; ‘08 Brosseau Vineyard Chardonnay; ‘07 Vieilles Vignes Syrah; and ‘09 Grenache Rosé, plus there are always a few older bottles passed around, not to mention a sneak peek of what’s to come with barrel samples. Music will be provided by Michael LaMacchia Trio. Ticket includes a souvenir Riedel glass or BYOG (glass) and receive a $10 off any wine purchase of $50 or more. The first 15 people who CHECK IN on Four Square at the Donkey & Goat Winery Release Party Saturday get a FREE copy of the The Tablehopper’s Guide to Dining and Drinking in San Francisco with any wine purchase.